The chapel was built in 1694 and was licensed for worship in January 1695. 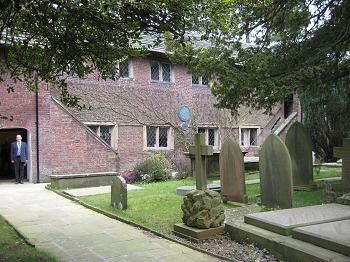 The Meeting House at Dean Row is strategically placed close to roads leading to Stockport, Macclesfield, and Wilmslow. Originally the denomination would have been described as Presbytarian or English Presbytarian. Like many dissenters' chapels it was placed outside the town. Following the Great Ejection of 1662, when 2000 ministers left the Church of England(they refused the ruling that the Book of Common Prayer had to be used in all acts of worship) the Five Mile Act was passed which forbade noncomformist ministers from preaching within 5 miles of an incorporated town and their former ministries. This act was only rescinded in 1812. The chapel has the general appearance of a barn, presumably in an attempt to avoid undue attention to those opposed to such a place of worship. It is built of mellow red brick beneath a stone flagged roof;there are two rows of windows along the length of the chapel. There are two external staircases which lead to two galleries, a congregational gallery and a choir loft which also houses the organ. The bell rope can also be seen at the back of the congregational gallery and is regularly used for services and special occasions.Indeed it was used to herald the New Millennium. The door beneath the congregational gallery stairs leads to the vestibule. On the left in the vestibule is found the Ten Commandments on a wooden board which was originally placed above the Communion Table at the front of the sanctuary. In the UK, the first Unitarian chapel was opened in 1774 in Essex Street by Theophilus Lindsay, even though it was illegal to deny the theological doctrine of the Trinity (God in three persons) until the Unitarian Relief Act of 1813. Originally the pews were arranged to face the north wall and the pulpit. The pulpit was moved to the east wall in 1845. There was originally a gallery along the south wall and this was dismantled at the same time. Note the inscription along the base of the congregational gallery regarding Jesus being the mediator between man and God (from the first epistle to Timothy). Curious in that Unitarians prefer to believe that no mediator is needed between man and God. Perhaps it is there to emphasise that Jesus was a man and not God, subject of many a sermon at Dean Row. On the dias (we do not call it an altar) is a communion table. Note the chalice symbols on the cloth of the lectern and the pulpit. The chalice light, the symbol of the Unitarian Movement, is lit at the beginning of each service. To the side of the east wall is a door leading to the vestry.Note the old Communion Table. The round table in the centre of the room is used for committee meetings. Note the pictures of former ministers, and paintings of the chapel at various periods of its existence. The vestry and the organ loft were used for pupils of any denomination from 1845 until 1861 when a purpose built school was constructed in Dean Row Road (now the Montessori school). Close to the western boundary is an outhouse formally used as the stables. Originally the southern boundary extended to the position of the sundial; the land beyond was a garden which was procured in 1879. The sundial erected in memory of the Chapel Founders was restored for the Millennium Celebrations. The Tercentenary Hall was opened by the minister Penny Johnson and the chapel children in 1994. The first burial took place in 1751 (Rachel Bates of Poynton). The family vaults of Worthington and Greg (associated with Styal Mill) are installed with drains which run towards the River Bollin.